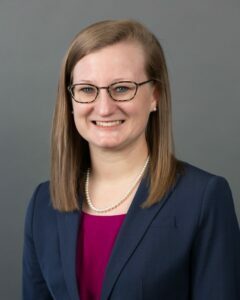 Campbell alumna, Emily Bratton (’15, ’15 MBA), is sponsoring the Young Alumni Challenge on #CampbellGivingDay on Wednesday, February 6. What does this mean? If 250 gifts are received from young alumni, seniors, or students within one day, $25,000 will be unlocked for the Campbell Leads campaign! Emily Bratton is from Roanoke Rapids, North Carolina – a small town about 100 miles north of Buies Creek on I-95. She graduated from Campbell in 2015 a bachelor’s degree in Trust and Wealth Management and a Master of Business Administration degree. She currently lives in Nashville, Tennessee where she works at U.S. Trust as a trust officer. What brought you to Campbell? The size, community and specialized major in Trust and Wealth Management brought me to Campbell. Campbell was my top (and basically only) choice. I knew that I wanted to go to a school where I was known as “Emily Bratton” and not as student #999999. The Trust program was equally a driver – from connections to and conversations with current Trust students at that time, I immediately knew that Trust and Wealth Management was the career path for me. What did you love about your Campbell experience? I love Campbell because of the connections. Whether making small talk on a plane and finding Campbell as a commonality, or living in a city like Atlanta, Georgia and realizing there are over 600 fellow Campbell alumni in the metro area. Or moving to a new city and feeling comfortable reaching-out to a fellow Camel about parts of town, or working for a global company where you cross paths with fellow members of the “Trust Mafia” daily. When I think about why I love Campbell, I think of the value of the connections Campbell helped foster. Why do you give to Campbell? What motivates you to give? I give to Campbell because Campbell gave to me. When I think about my time at Campbell, I realize there were many people, both alive and deceased, that were a part of my educational experience: scholarship donors, professors, friends, classmates and coworkers. I also recognize that I would not be in my seat today, and at this place in my career, if it were not for Campbell and my Campbell connections. I hope that my gifts, both monetary and time, will serve to empower students the way that Campbell empowered me. Why should others give to Campbell? We all have many gifts – whether talents, finances, and/or time. A gift is simply a gesture of kindness – and people’s kindness will impact us through every phase of life. Someone’s gift impacted us all while we were at Campbell – buildings, technology, scholarships, volunteered time – and we each have the opportunity to pay that forward today. 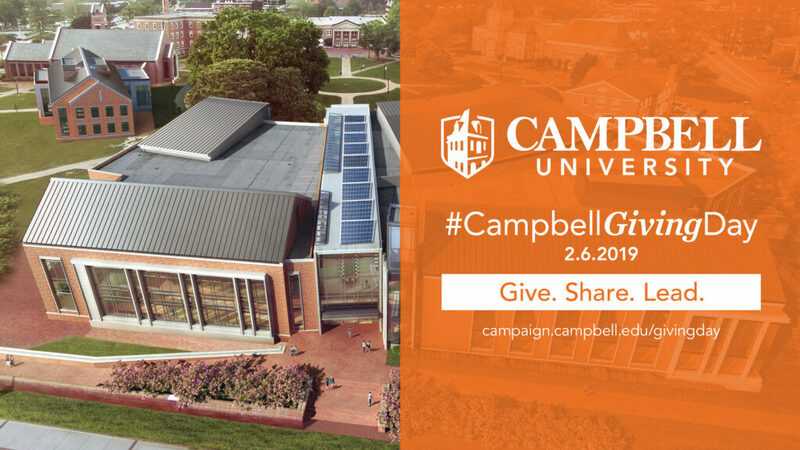 CampbellGivingDay is a day driven by teamwork and social media where we ask members of the Campbell community (alumni, faculty, staff, students, and friends) to give a gift to Campbell, share why they give on social media, and lead others to do so, all on a Wear-Orange Wednesday. Learn how you can Give. Share. and Lead at campaign.campbel.edu/givingday.